On-the-go real-time tracking of emotional states through facial expressions and then offer corrective feedback and strategies to modify your state of mind so as to become emotionally fit. In the daily hustle-bustle, people tend to accumulate different kinds of stresses and anxieties leading to emotional upheaval. It is generally believed that only weekends and vacations are meant for relaxation. But what about the everyday damage caused by this emotional accumulation? Yes, it leads us to think that people should meditate to calm themselves. Well, this is even more challenging because everybody is busy juggling with their daily routines that it becomes difficult to add another activity in the day. More importantly, these days people want everything to be ‘on-the-go’, eases the emotional burden at that very moment and be cost-effective. There are ‘mood tracking’ apps which typically requires self-report interpretations for mood journals. There are ‘meditation’ apps but those can only be used when a person actually sits down to meditate which is the struggle with most people because they find it hard to set aside time to meditate or relax. There are couple of highly expensive solutions that work with wearables. But there aren’t any on-the-go tools that track emotional states in real-time by using facial expressions and help the person get relaxed on moment-to-moment basis. 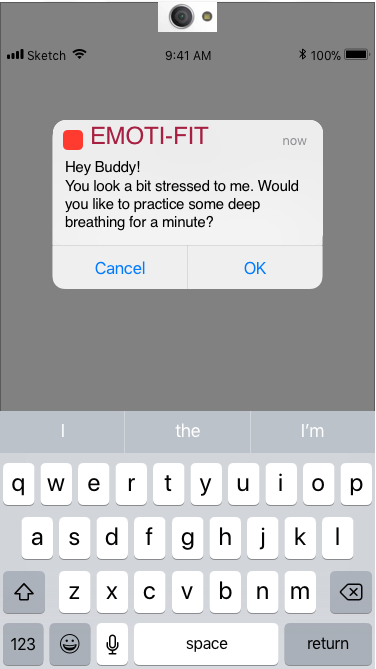 Emoti-Fit : an app to track emotional states of a person in real-time whenever the user looks at the phone screen. Based on the data, it will automatically suggest some relaxation activities and strategies that can be practiced on-the-go. Customers download all sorts of mood tracking and meditation apps but either they find it hard to stick to regular schedule for meditation or will forget to self-report their mood states as the time passes by. Studies have shown that on an average, people tend to look at their phone screens between 33-85 times per day. This tool will give real-time corrective feedback to help them navigate through their emotional states essential for physical and mental fitness. Freemium Model (tentative) : Two weeks of trial version where users can explore all the features. Then basic features free and others paid. The basic features will be guided meditation/relaxation but real-time tracking only once a day.